Microsoft Office Word and Publisher 2010 support OpenType typography features. This allows you to take advantage of the typography capabilities in many OpenType fonts. End result is super stylish text on your documents like on company letterhead, personal invitations by using ligatures and stylistic sets for more sophistication to your publications. 1. Click dialog launch icon in the Font Group on the Home tab. 2. Then in Font dialog box, click the Advanced tab. OpenType typography features in Microsoft Word 2010 include:Stylistic sets, Number forms and number spacing, Ligatures and OpenType kerning.You can try ligatures in Constantia or number forms and spacing in Calibri or Cambria. 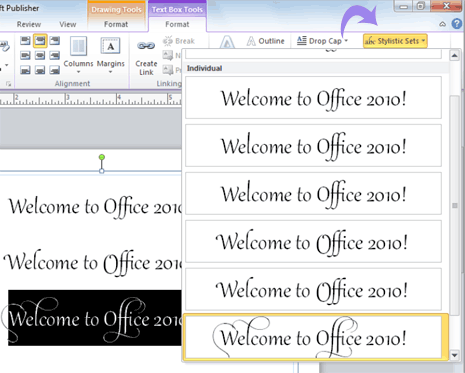 Also try Gabriola, a new font in Office 2010 that offers a rich array of stylistic sets. Typography effects are also available in Microsoft PowerPoint 2010. Select text within any text box. Then, on the Text Box Tools Format tab, explore the options in the Typography group.